Three stations in top 10 all channels, audience appreciation on the 18-49 target and the number 1 news channel position in a very eventful month – sums up a very intense February for Intact Media Group’s TV Division. The group’s family of channels had evolving numbers during Morning and Access slots, with market share numbers up 5%, respectively 4% vis-à-vis February 2017. On the urban target, the Antena channels led the audiences during Day Time and Access, while they claimed the Access slot on the national level. 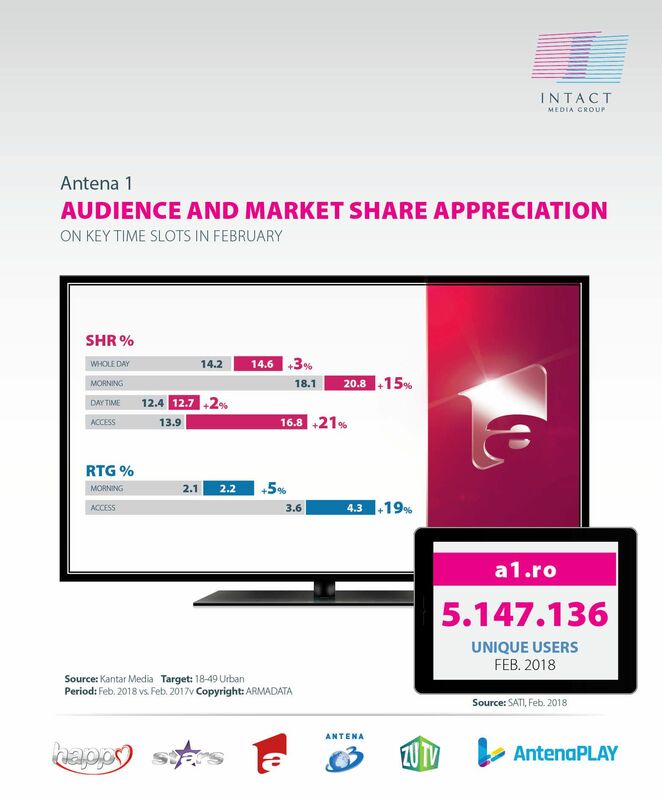 Antena 1, the flagship entertainment channel, home to the largest star system in Romania, showed market share and audience evolution during key slots on the commercial target. In this respect, its Morning interval grows by 5% rating and 15% market share on the 18-49 target, while the Access slot boosts its numbers with 19% rating and 21% share. Evolving numbers on these intervals are also seen on the urban (+12% morning/ +7% Access) and national targets( +6% Morning/+1% Access). The market share was on an ascending track on the majority of timeslots on the commercial target, including Whole Day and Day Time. Among the most watched productions in February were the new season of “IUmor”(comedy show), the launch of “Asia Expres” (reality show) “Fructul oprit” (series) and “Guess my age” (quiz show). On the national target, the Monday to Friday Access production “Acces Direct” was the absolute leader of its slot (17-19), scoring 100% leadership. 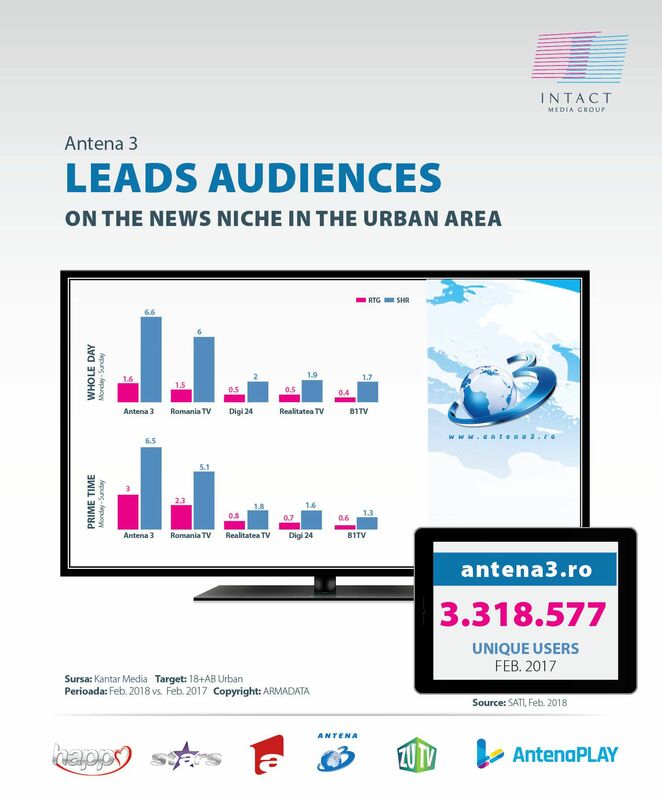 Antena 1 was watched in February, during the Whole Day, for at least one minute, by 8.1 million Romanians, whilst www.A1.ro had more than 5.147.136 unique viewers. Antena Stars, the only TV channel dedicated to celebrities, was watched during February by more than 3.2 million viewers, on the national target, during Whole Day, for at least one minute. Compared to February 2017, Antena Stars appreciates its audience and market share by 50%, respectively 11% during the Access slot. Antena Stars’ most popular productions last month were “Refresh by Oana Turcu”, “Starchef, “Agenția VIP”and “Dosarele VIP. Happy Channel, the Group’s TV station addressed to women, was watched during February by more than 1,2 million viewers at the national level, for at least one minute, during Whole Day. The most popular series were “ Intrusul” (Insider), “Elif”, “Rădăcini”( Roots) and “A doua șansă”. Antena 3 was leader of the news niche on three targets in February, being the most watched news channel during special events. As such, the news channel led the primetime interval (19-24) as well as the whole day on the 18+Urban, All Urban and 25-54 Urban targets. Moreover, Antena 3 has the biggest number of talk-shows in the all news programs monthly chart, on all targets. The most popular programs were Adevăruri Ascunse”, Sinteza Zilei,“Voi cu Voicu”, “Subiectiv”. The channel was watched by 4,2 million viewers during the Whole Day, for at least one minute, in February. On the digital front, Antena3.ro had more than 3.318.577 unique viewers. 9,8 million Romanians watched Intact’s productions during the Whole Day, for at least one minute, on national level in February, while 7.2 million were reached during Prime Time. Intact Media Group thanks its public and partners for all their support and loyalty. Intact offers the ultimate content mix through its multichannel platform, for all age segments and consumer preferences.